The creature on the right has the ability to change color depending on mood, lighting, temperature and other environmental influences. It also has eyes that move independently from each other and rotate in all directions. What traits might the shiny object on the left display? Getting straight to the point, I was altogether engaged on the musical front. Given the amount of ink already spilled on this unit, I won't venture into construction or design chatter other than to say that emblematic of Art Audio and their well-vetted partners -- in this case, Kevin Carter of K & K Audio -- the fit and finish are first rate and the chassis offers a effortless yet graceful look. I will also note two kewl functionality factors: switchable signal polarity and MM/MC loading impedance. No, it's not nearly as decked out with loading and gain choices as the Manley Steelhead but you can still contentedly play with a mixture of MM and MC carts. This unit's elasticity extends to both single-ended and balanced systems. To read some of the talk on various Internet fora, one could easily come away with the impression that the Vinyl Reference (VR) is an excellent phonostage, the ticket for people who listen predominantly to classical and vocal music - but that it doesn't get it up for those who groove on rock, jazz and soul. So, I set out to determine for myself whether the VR was a one-trick member of the Equidae family or a dexterous affiliate of the family Chamaeleonidae. After three months of listening, alone and with other trusted ears, I have two things to report: It is an excellent phonostage. And, it is not limited in its ability to convey various classifications of music. With respect to what you read below, please be aware that while I did (with great pleasure) assess the VR's competency on classical and vocal works, my decision to limit musical examples to the genres you will encounter was intentional. Can you tie tension and flow? The very first thing that jumped out at me through this dead-quiet device was on the very first album played. It was the morning after. I had hooked her up on Saturday night, just to settle in so I could have a long day of listening come daybreak. True to form, I woke up early with food on the brain. My dreams of eggs over easy with flour tortillas naturally led to a craving to hear "Nobody Knows Me". So before firing up the stove, I nudged the needle towards the midpoint of the slow side of Lyle Lovett's ... and his Large Band. It became instantaneously evident that sliding the VR into the signal corridor had created what appeared to be an elongating of measures in the music. It struck me -- and registered as odd -- because it seemed, at first glance, to have the effect of making the tempo more leisurely - maybe even slow. Not plodding, mind you, but, shall we say, lingering. Yes, that's the right feeling. Then I listened to the fast face (side one) and found that while the phrasing remained farther-reaching, the music moved along with more ambition than I'd before experienced from this slice of licorice pizza. There were also persuasively produced bends and drawn-out decays on guitars, plus a differentiation of voices both within and among. Meaning, in part, that Lovett's voice had more texture and scope of character while brass both cried and caressed. All this was liberated in the context of what some loaded-for-bear sonic fiends might describe as mellifluous management. Heathens! I would call it a liquid emancipation of potential: the release of those goods in the grooves that often elude us. Since I am familiar with presentations that are overly silky, I can assure you that there was no Velveeta® in the dip here. So, this was not that. This was like a great tequila that goes down smooth but still completes its more primal assignment. Besides, who wants to be assaulted with sounds? I want music. Call it passion over reason. On You Get More Bounce with Curtis Counce, percussion on the first track was more communicative due to better timbral differentiation and a genuine extension in frequency response. That, combined with a level of insistence to the rhythm that never caught my ear before, had me asking. "How did I ever miss this?" On track two, I was offered up my favorite kind of sax: a three-dimensional body sending out visceral waves of sultry seduction underscored with insightful microdynamic fluency. If you come to expect this level of - um, culmination in every session, you'll need to pay attention to your partner's needs, too. In this case, take advantage of her mutually satisfying pleas that you develop an appetite for properly tweaking the polarity switch as required. Since it can -- to roughly paraphrase Tammy Wynette -- make the difference between an angel on Sunday morning and a devil on Saturday night, experimentation is highly recommended. Just do it. In this setting, Carol Kidd's Nice Work if You Can Get It delivered all the swing that one would expect from a Linn recording. But, make no mistake, not all systems can dispense on that front. Not a problem here. It also did much more: Open, airy and sparkling ivories at that top, well articulated and cricket-like buzzing bass, punchy percussion and an exceptional sense of venue. Of course, Ms. Kidd furnished the lyrical goods, too. You'll find no monochromatic or rote recital here. Each song, and every album that you fervently pluck from your collection, will be possessed of an individuated disposition. Indeed, while the Vinyl Reference can make that which deserves to sound sweet do so, it also delivers on the more antagonistic and forceful fronts as well. Take, for example, Dire Straits' eponymous album, filled with both understated and blatant tension and drama. "Down To the Waterline" will get you going from riff one; nothing subtle here when lyrics like "...your hands are cold, but your lips are warm..." are accompanied with bitterly ardent guitar work. That's quite a departure from Knopfler's mostly mischievous team effort with Chet Atkins on Neck and Neck. There, more restrained guitar licks (some even learned in vacation Bible school) are exchanged, meaning we'll just have to cite the former as an example of much more primal. What we have here is a component that can, like a sonic chameleon, convey the emotional shifts from harmonious to confrontational without a blink or a change of gear. "Six Blade Knife" (from the former album) carves out its own rocking personality just as distinctly as the melancholic "One More Time" does on the latter. As I retrieved the next album on my list, I wondered, for the umpteenth time, "How is it that Neck and Neck (voted best country instrumental performance in 1991) and Muddy Waters' recording of Folk Singer (1915-1983) can each get a Grammy but they keep on missing Lightnin' Hopkins (1912-1982)? The Analogue Productions pressing of Goin' Away is a seriously dynamic representation of the latter genre and to my ears, a more interesting recording because Hopkins cedes the roots-based goods with more soul and certitude. That bias aside, when played through the VR, songs like the title track are slow and moving while "Wake Up Old Lady" exemplifies, in ways that other units fail, his ability to bring lyrical phrases that start with words to a close with his guitar - instead of his voice. No small feat. But that's how convincing and entwined the message becomes - and this is the first phonostage to convincingly convey that tie between the verbal and non-verbal. It's that organic and coherent. So, if I had the green, I'd send a VR to the Grammy committee for sure. Maybe that would help. While it can and has, Allison Krauss's pure and transparent voice never ever sounded pinched through the Vinyl Reference. Team her up with musicians who can pull strings so they both lull and sting and you've got the makings of a serious musical brew. Some of you familiar with the first track on New Favorite and so inclined to, um - daydreaming already know that the second track, "The Boy Who Wouldn't Hoe Corn" comes up just about the time your fantasy date with Alison singing "... let me touch you for awhile..." is starting to get steamy. "The Boy" shakes you right out of that and before you know it -- and as if fused with yet another set of lyrics -- not only is all the young man's corn lost, so are you ... in such a so well-defined, three-dimensional sea of guitar strings, dobro twangs and fiddle accents that it makes you wonder why would anyone "give that boy the devil" when there's all this music to behold? The answer: Because many phonostages, when faced with this onslaught of energy, will give you more glare than goods. Long story short, if you've got a yang-ish system and look for some relief that doesn't compromise detail, look no further. There's certainly enough musical and consistently unfolding deep resolution to keep your attention without ever putting you on edge. If you are already at ease with your stellar vinyl rig and wonder just how far the sonic seduction can go, take the VR for a spin. Next up is Laurie Anderson's Strange Angels. How does the VR reproduce electronica with the "I'm sick of hearing 'bout your problems" kind of edge, grit, grain or gravitas? Very well, thank you. The AA VR gives you all four, in proper proportions, all the while keeping you in the groove. So, Joe, how do you balance grit and groove? "Hey man, you start by paying attention to amplifier noise, ya know? Then take a look at sensitivity to RF interference, gain, output stage drive capability, overload and flat frequency response. Next you gotta design a hybrid FET/triode circuit to meet the requirements of low noise and high gain with a minimum of amplifying stages. 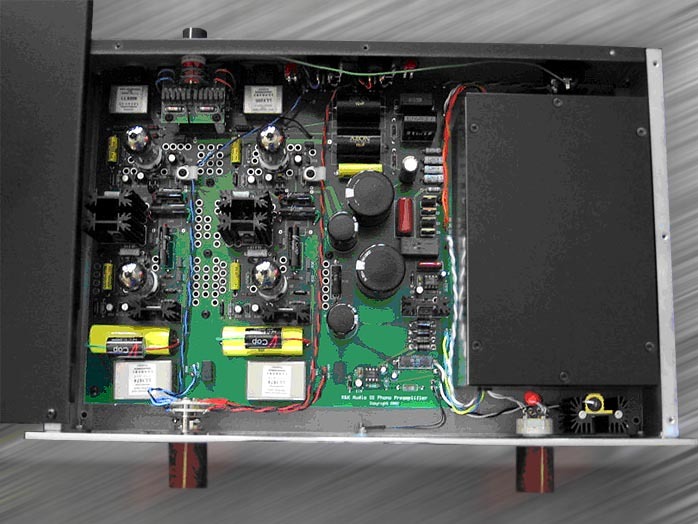 Lastly, add a transformer-coupled MOSFET/triode output stage, a high-voltage, choke loaded and seriously filtered and shunt regulated massive power supply to minimize the creation and transmission of noise. Okay?" Wow. No wonder Laurie sounds sweet and savage. Laurie both growls and purrs - and does so on a stage much larger and airier than you may have previously been aware of. You, too, may also hear more (and more plainly) some of the interesting electronica (programmed percussion) and natural hidden musical nuances (accordions, violins, pedal steel guitars and vocal murmurs) she tucks into the sub terrain of this recording. Next up, Isaac Hayes and some Hot Buttered Soul. Where else will you hear a hipper inflected version of "Walk on By"? Hayes, the sweet backup vocals and the Bar-Kays rhythm section create a soundscape that will immerse you in a level of suave and never dry detail that leaves you breathless. And in this case, the almost (but never fully) out-of-place biting, acid Jazz inflected guitar won't shut your ears down. Within a week of taking it out of the box, I dubbed the unit "the SET of phonostages". And not your hackneyed, overly-ripe midrange, mushy-bass, roll-off-at-the-extremes coloration-inducing machine but a well-executed design. It's smooth, intimate and dark in the best way possible. Think Isaac Hayes and Hot Buttered Soul in the studio. It's propulsive, perceptive and dynamically adept. Think Laurie Anderson and Strange Angels on the stage. Consider the differences in those two styles and you may agree with the chameleon simile. The VR will, in a synergistic context, adapt to and then perform according to the impulse provided. Last, I just want to mention a recording that offered an unusual surprise. Even as someone with an affirmative mindset about the value of properly executed SETs, I found the experience of listening to Daniel Lanois' Acadie somewhat counter-intuitive and instructive indeed. From the predictable -- read: rather dense -- production values emerged a more coherent level of instrumental articulation and vocal finesse. On "Where the Hawkwind Kills" came a level of definition to the drums that was anything but veiled, contrary to what I've heard with other such devices under test. Full yet tight, closure to words like night and flight brought finality to the verse with the 't'. Texture is always something I expect from this disc. Such speed emerging from the built-in distortion I did not. There are three potential caveats that I identified: 1. Because I am content with bass that is more organic (vs. 'tight') than some prefer, I can also easily live with what may be a deal breaker for others. The rest is that good. 2. There are those who may find the VR dynamically limited - as I did only when using my AudioZone integrated. 3. There are systems where the upper mids may become overly prominent when using this unit. As always, system synergy is critical. And, personal predilections almost always lead to preferred "presentations" when attempting to achieve not the but an absolute sound from our rigs. I thought it had a very natural transient attack. Period. Fellow moonster and listening buddy Jeff Day thought otherwise, suggesting that the "attack is a bit blunted". But he also said, in his final note to me following extended listening in both of our systems, "decay is extended ... attack is a bit blunted ... but that's not bad ... rich ... detailed. I still haven't heard what I want in my ultimate phonostage, although the AA comes closest so far. My only quibbles with the AA are bass performance, overall detail recovery and the upper midrange peakiness it can have, depending on system context. It's particularly nice in your rig, which seems to be sympathetic to its shortcomings, resulting in a very musical sound. It's the sonic equivalent of what it feels like to be in love. It might not be reality but it's beautiful and hey, reality is often overrated!" The late Gizmo said it well in his essay on Harmonic Self Hypnosis: "The best of you know best how to create the music illusion in your living room that disconnects you from earthly gravity and lets your musical soul ascend ..."
In the end, I agree with Jeff that the bass does not have the authority or articulation of the TEAD but I do find the Art Audio musical. In each of our systems, we both like it better than the $7,300 Manley Steelhead (which struck us as less transparent) and the $7,000 TEAD Groove + (which, to our ears, is comparatively more hifi-ish). Lastly, we also agreed that the Vinyl Reference brings the music home versus taking you to the venue - and so, the music blends seamlessly with your acoustic space. Of course, anyone can do the math. What's more important is that should the opportunity present itself, make it a point to give the Vinyl Reference a spin. I did and became hooked on the most natural sounding phonostage I've encountered yet. If the opportunity doesn't present itself? Make it a point to create your own chance at a listen. This unit is distributed under the watchful eye of Art Audio. If the many dealers who carry the unit are only half as passionate and driven as Joe Fratus and his partners, you will have a great time and an ear-opening experience. To wrap this up, I'll return to where I started when speaking of sonic impressions: "...It became instantaneously evident that sliding the VR into the signal corridor had created what appeared to be an elongating of measures in the music..." In the end, that's what I keep coming back to but now my heart and body understand that effect at a deeper level. It's about phrasing. Look at some sheet music and notice the ligatures between notes and across bars. They instruct the musician to convey the flow and nuance that embody the intent of the composition. This is much different than hitting the rights notes in the right order at the right time. Those are simply details when it comes to adept musicianship. Details (like selective sounds that some people listen for in their recordings and mistake for resolution) are simply fleeting events. Genuine resolution is a process. Real music doesn't happen. It unfolds. Normally, I might complete a review with three words to describe the overall character of a component. In this case, I would use words like organic, accomplished and nourishing. Today, I'm compelled to also say, "I want one." 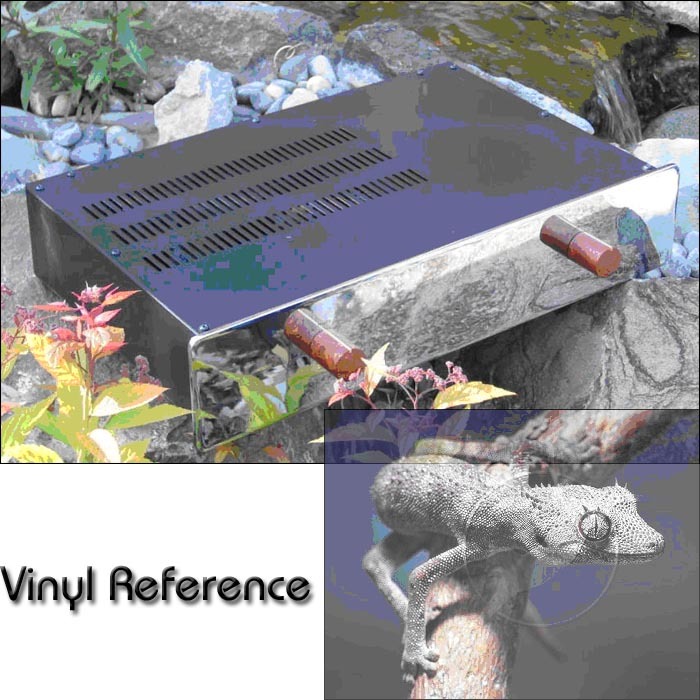 On behalf of Joe Fratus and Art Audio USA, please accept my thanks for a thorough review of the Vinyl Reference that successfully complements the reviews that are already in print (cyberprint, too?) and for the coveted Blue Moon award. We appreciate the effort that Stephæn and his colleague expended to address the musical effectiveness of the Vinyl Reference with all types of music. As the designer, I have musical preferences, but do listen to a variety of types of music, too. Indeed, I want the equipment I design to convey the sweet melancholy of a Chopin etude, the raw power of Led Zeppelin's bluesy rock, the foot tappin' rhythm of Leo Kottke's guitar, or the seductive lilt of Tift Merritt's voice, as is appropriate. The chief criterion for any of the design decisions made in the course of developing the Vinyl Reference was their effect on the musical "rightness" of the reproduced sound evaluated using a wide range of recordings. I should note that the performance of the reviewed "hot-rod" Vinyl Reference with V-Caps is available to all Vinyl Reference owners. For $500 Art Audio will retrofit any Vinyl Reference with V-Caps.